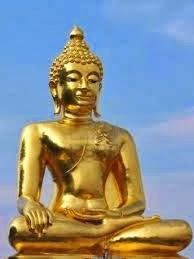 Songs of Eretz Poetry Review: New Poem: "Buddha Quest"
"Buddha Quest" is the latest installment in my poetic memoir, A Wave of Poetry. With time to kill in Thailand, Rudy, the Chaplain, McNamee, and I decided to hike to a park that had an enormous statue of Buddha in it. The journey turned out to be epic--a real odyssey of enlightenment. Several times Rudy, McNamee, and I wanted to turn back, but the Chaplain provided the spirit for us to persevere. We finally reached the park and, after braving wild dogs and climbing tortuous stairs, our goal. The return journey was easier, and we stopped at a restaurant for my first taste of authentic Thai cuisine.